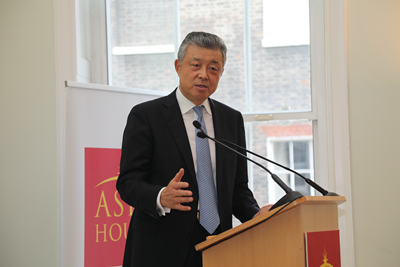 Five years ago, when I gave a speech to the British business community about the 18th National Congress of the Communist Party of China, I talked about my confidence in the prospects for China's development. The past five years have shown that I was right to be confident. Over the past five years, China's achievements have touched every area and broken new ground. The changes in China have been profound and fundamental. These achievements and changes are having powerful and far-reaching impact on China's development. Five years later, we are gathered again following the successful 19th CPC Congress. Today, it is my great pleasure to join you and share my thoughts and observations on this epoch-making Congress. I attended this Congress and I was deeply impressed by the long list of outcomes and far-reaching impacts. General Secretary Xi Jinping's report at the Congress summarized the historic achievements and changes with regard to China's development over the past five years. There have been overarching advancements in the political, theoretical and practical aspects. The meeting rolled out strategic plans for Party building and national development. A new era of socialism with Chinese characteristics has begun. A new journey to build China into a modern socialist country has started. And new commitments are made by China to make the world a better place. There is no doubt about the significance of the guiding principles and action plans adopted at the 19th Congress. They are historic landmarks for the Chinese nation, for socialism and for human society. So what exactly does the 19th Congress mean to China? What does it mean to the world? And what does it mean to China-UK relations? To explain the significance and impact of the Congress, let me begin with its four major outcomes. First, the 19th Congress set the fundamental guideline for China's development. The Chinese philosophy emphasizes the importance of guidance. "Where there is clear and strong guidance the rest will naturally follow", as our ancient sage said. The report of the 19th Congress provides such a clear and strong guidance. It is Xi Jinping Thought on Socialism with Chinese Characteristics for the New Era. This is established as the theoretical guidance that the Communist Party of China must adhere to in the long run. Theoretical guidance is the soul of a political party. The Communist Party of China has a history of 96 years and has been in government for 68 years. It is the largest political party in the world, with 89 million members. It is a party that has led the Chinese people in achieving remarkable development. It is a party that has led the Chinese nation in a tremendous transformation from getting on its feet to growing prosperous and becoming strong. None of these would have been possible without the CPC's consistent efforts to enrich and develop Marxism. Xi Jinping Thought represents the CPC's latest achievement in adapting Marxism to the Chinese context. It is an important component of the system of theories of socialism with Chinese characteristics. It is an action guide for realizing the Chinese dream of national rejuvenation. Second, the 19th Congress has come to the important conclusion about the evolving contradiction facing Chinese society. Socialism with Chinese characteristics has crossed the threshold into a new era. This is a new historic juncture in China's development. Enormous social progress has been achieved under the leadership of the CPC since reform and opening-up began nearly four decades ago. Against this historical background, the principal contradiction facing Chinese society has evolved. And so has our main task. What we must do now is to address the unbalanced and inadequate development in order to meet the people's ever-growing need for a better life. A better life not only means growing material and cultural needs. A better life entails greater democracy, rule of law, fairness and justice, security, and a better environment. While China sees its overall productive forces significantly improved, and in many areas leading the world, our development remains unbalanced and inadequate. The principle contradiction now is between people's growing need for a better life and the unbalanced and inadequate development. Contradiction is the fundamental driving force of progress. The change of China's principle contradiction has given rise to new issues that we must address. The CPC will do its utmost to live up to the people's expectations, to meet their growing needs in all aspects, and to ensure a strong sense of fulfillment and a feeling of happiness and security across the country. And it will work for well-rounded development for every individual and social progress in all respects. Third, the 19th Congress mapped out a new blueprint for China's development in the coming decades. and building China into a great modern socialist country that is prosperous, strong, democratic, culturally advanced, harmonious and beautiful by the middle of this century. These goals present a detailed vision of the "two centenary goals", which marks the 100th anniversary of the Party in 2021 and the People's Republic in 2049. To succeed in any endeavour, perseverance is the essence and innovation is the way. If you compare the new blueprint with its predecessor, it is not difficult to see the adjustments and updates to the previous timetable. Let me list out some of the key ones. The time needed for achieving basic socialist modernization is shortened by 15 years. The word "beautiful" is added as an indispensable benchmark defining the "great modern socialist country". Doubling GDP is no longer the target, and it is replaced with comprehensive, high-quality and sustainable development. These adjustments speak to the character and the progressive nature of the Communist Party of China. This is a party that keeps an open mind, seeks truth from facts and moves forward with the times. This is a party that is gaining a deeper understanding of the law of building socialism. This is a party that is raising a beacon light for socialism with Chinese characteristics in the new era. Historically, the journey to modernization for most developed countries and regions in the world took almost 300 years. But in China, a country with a population of more than 1.3 billion, the CPC is determined to complete this journey in 100 years. The speed and scale of change would be unprecedented. The extent and depth of change would also be unseen before. However, we are confident that we can do it. We will stick to our timetable and our road map. We will press ahead with perseverance. The "China miracle" will be a splendid chapter in the history of human civilizations. Fourth, the 19th Congress elected a new CPC leadership. A great cause calls for strong and firm guidance. History tells us that in a massive country like China, development and progress would be impossible without a strong leadership. Over the past five years, the achievements we made and the changes taking place in China have been phenomenal. These must be attributed to the strong and firm leadership of the Party. At the first session of the 19th Central Committee, Xi Jinping was once again elected General Secretary. This reflects the common aspiration of the people. Looking ahead, the five years between the 19th and the 20th CPC National Congress will be a crucial phase in China's development. This will be the period in which the time frames of the two centenary goals converge. It will see many exciting landmark anniversaries. The year 2018 will mark 40 years of China's reform and opening-up endeavour. In 2019 we will celebrate 70 years of the founding of the People's Republic. In 2020, we will complete the building of a moderately prosperous society. And in 2021, the CPC will mark its 100th anniversary. These are important signposts that will map our way ahead and keep us motivated. Now, the new CPC leadership is closely rallied around General Secretary Xi Jinping. This new central leadership is giving the Chinese people great confidence. They are committed to leading the Chinese people into a new era. They are uniting the whole nation in a concerted effort to realise the Chinese dream of the great rejuvenation of the Chinese nation. We have thought thoroughly. We have planned carefully. And now we must act accordingly and decisively. In the coming years, the prospects of China's economic and social development will be good and exciting. First, China will achieve high-quality development. As socialism with Chinese characteristics enters into a new era, China's economy will continue to shift from high-speed growth to high-quality development. China will seek better quality, higher efficiency and more robust growth drivers through reform. And on this basis, we aim to achieve the strategic goal of building a modernized economy, enhance total factor productivity and strengthen innovation capacity and economic competitiveness. High-quality growth also requires us to implement new development concepts. The supply-side structural reform will continue. New industrialization, IT application, urbanization, and agricultural modernization will go hand in hand. Efforts to build China into a country of innovators will accelerate. The rural vitalization strategy and coordinated regional development strategy will be implemented. Improving the socialist market economy and building an open economy of higher standards will continue to be our goal. Second, China will ensure inclusive growth. The Chinese dream means every individual will have the opportunity to excel in life. No one shall be left behind. To achieve this, development must be inclusive and prosperity must be shared. As the country grows stronger, we will make sure that every citizen is able to feel a stronger sense of personal fulfillment and a feeling of happiness and security. We will put in place unified basic pension schemes and basic medical insurance system that have extensive coverage in both urban and rural areas. We will build more affordable homes. We will increase investment in higher education and vocational skills training. All in all, we will work to ensure that the benefits of development are shared by each and everyone in the country. It is notable that General Secretary Xi drew the longest applause when he said this in his report : "We must not forget that houses are for living in, not for speculating on". These words certainly echo a common concern. At the same time, they stress that development must be for the people, and that the CPC stays committed to the wellbeing of the people. Third, China will strive for green growth. Eco-environmental conservation was given considerable priority at the Congress. In the Report, "ecological civilization" appeared twelve times, "beautiful China" eight times and "green" fifteen times. A great modern socialist country should be prosperous, strong, democratic, culturally advanced, harmonious, and beautiful. For the first time, building a "beautiful China" becomes a key dimension of a great modern socialist country. And for the first time, "ensuring harmony between man and nature" becomes a basic policy that underpins socialism with Chinese characteristics for the new era. General Secretary Xi says, "Clear waters and green mountains are as valuable as mountains of gold and silver." These plain words carry profound ideas. Ecological civilization is vital to sustain the development of the Chinese nation. Environment will be protected the same way as we cherish life. We will redouble our efforts to develop green finance, energy-saving and environmental protection industries as well as clean production and clean energy industries. We will establish regulatory agencies to manage state-owned natural resource assets and monitor natural ecosystems. We will step up campaigns to prevent and control water, air and land pollution. We will take tough steps to bring polluters to account. Fourth, China will stay committed to open growth. Next year will mark 40 years of China's reform and opening-up. 40 years on, China will open its door even wider to the world. China's commitment to open growth will not change. We will reach out to the world, develop global partnerships and expand convergence of interests with other countries. China will not impose "imparity clause" upon others or profit at others' expense. Instead, we are ready to share the benefits with other countries and welcome them aboard the fast train of China's development. China's approach to global partnership is that countries should stick together through thick and thin. China will work with other countries to promote trade and investment liberalization and facilitation and build an open world economy. We will advance international cooperation on the Belt and Road. This initiative is a platform for international cooperation and can enable partners to achieve common prosperity. We will increase assistance to other developing countries, especially the least developed countries, and do our part to close the development gap. We will work for balanced and inclusive global growth with a view to building a community of shared future for mankind. At the same time, we are clearly aware of the many challenges and tasks we face at home. China's development remains unbalanced and inadequate. Growth still needs a stronger and self-sustaining driving force. Economic and financial risks require serious attention. Pollution remains a daunting challenge. There are still weak links in housing, education, health, pension, food and drug safety, income distribution, etc. Beyond our borders, external challenges also deserve our attention. Regional hotspots are flaring up. Unconventional security threats, such as terrorism, cyber security and climate change, are looming large. and economic transition and upgrading is creating enormous potential. We will build a strong defense to forestall systemic financial risks. We will improve the financial regulatory system, curb local debt increase and de-leverage state-owned enterprises. We will optimize the state-owned asset management system and take effective measures to prevent the loss of state assets. We will introduce a negative list for market access nationwide. This will encourage fair competition between Chinese and foreign businesses and provide a level playing field and business-friendly environment. Let me quote an old Chinese saying. "He who does not have a long-term plan is not up to short term jobs. He who does not have the whole picture in mind can not design a part." The Report of the 19th Congress demonstrates both a historical vision and a global perspective. Those attending the Congress clearly have a "map of the world" in their minds. I think what this Congress brings to the world, including Britain, are China's wisdom, China's concepts and China's opportunities. First, China's wisdom enriches the world's political and social system. Since adopting reform and opening-up policies, China has been committed to a path of socialism with Chinese characteristics. This is a path of our own choice. This path has led China to become the world's second largest economy and to have lifted 700 million people out of poverty. China is now on its way towards moderate prosperity. The key to such achievement is that we have found a development path that suits China. It is a path led by the CPC leadership. It is a path based on national conditions and practical experience. It is a path that draws from traditional Chinese culture. It is a path that draws on the best of Eastern and Western civilizations. It is a path of constant exploration and innovation. Xi Jinping Thought on Socialism with Chinese Characteristics for the New Era is the extract summary and development of China's path, system, theory and culture. China has made much progress in building socialism with its own features. This has expanded the horizon for developing countries seeking modernization. Countries and nations who want to speed up their development while preserving their independence are given a new option. And this is China's wisdom and solution. Confucius once said, "Do not do onto others what you don't want others do onto you." China believes that no one should sanctify its own development model or even impose it upon others. China respects the right of all countries to choose their own development path. China will not export its own development path or model, or its own value. China is not interested in the competition of ideologies. Other countries are free to find out more about China's development experience and draw on strength or reference as they see fit. They should explore a development path and social system that suits their own history and culture. This is, in essence, the biggest contribution of China's path of socialism with Chinese characteristics to all humanity. 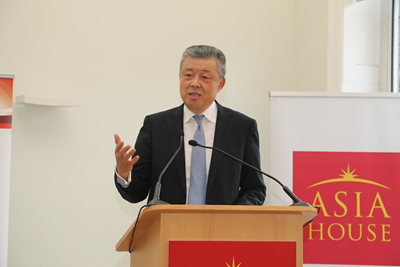 Second, China's concepts enrich contemporary international relations. China follows a path of peaceful development. China pursues a mutually beneficial strategy of opening up. China upholds justice while pursuing shared interests. China seeks open, innovative and inclusive development that benefits everyone. China safeguards world peace, contributes to global development, and upholds international order. In keeping with these concepts, China will never pursue development at the expense of others. But China will never give up its legitimate rights and interests. China will continue to develop and become stronger, but China will never seek hegemony or engage in expansion. China is committed to forging a new form of international relations featuring mutual respect, fairness, justice, and win-win cooperation.China will never repeat the old trajectory, namely, "the winner takes it all" or "strength leads to hegemony". China opts for the new approach to state-to-state relations. We want dialogue, not confrontation. We want partnership, not alliance with one against another. 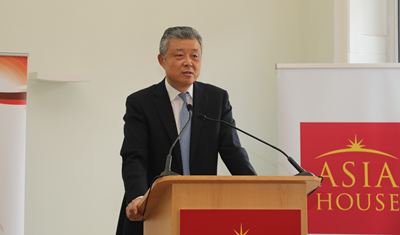 We believe that the interests of the Chinese people are closely connected with that of the peoples of other countries. And we believe that people all share the same dream for a better future of the world. China looks to work together with all other countries to build an open, inclusive, clean, and beautiful world that enjoys lasting peace, universal security and common prosperity. Our concerted efforts will lead us to the dream of a community with a shared future for mankind. Third, China's opportunities enrich the win-win cooperation of the world. China will continue to open up to the world. This is a fundamental policy. We pursue development with our doors wide open. In particular, we are working actively to advance international cooperation on the Belt and Road Initiative. We support multilateral trade regimes and work to facilitate the establishment of free trade areas and the building of an open world economy. We work for a more open, inclusive, and balanced economic globalization, and we believe the benefit of globalization should be shared by all. At present, China is the largest trading partner of more than 120 countries and regions. China is also the world's second largest investor and the biggest destination for foreign direct investment. China's investment and trade activities create 15 million jobs in the world every year, including 180,000 jobs in the countries along the Belt and Road routes. As an old Chinese saying goes, "The more you do for others, the more you will gain. The more you share with others, the more you will have." Win-win cooperation has long been the philosophy of life for the Chinese people. It is also the principle that China will continue to follow in its relations with the world. A China committed to win-win cooperation will bring greater development opportunities for countries around the world. China will increase access to its domestic market, including the services sector. China will enhance IPR protection, try out free trade ports and advance the Belt and Road Initiative. In November next year, China will host the first International Import Expo in Shanghai. In 2019, China will host the second Belt and Road Forum for International Cooperation. From 2018 to 2020, China is expected to grow by at least 6.3 percent every year. This will surely help sustain growth in the world. In the coming five years, China will import 8000 billion US dollars of goods, attract 600 billion dollars of foreign investment and make 750 billion dollars in outbound investment. Chinese nationals will make about 700 million visits overseas. These prospects promise a broad market, abundant capital, a great variety of products and huge opportunities for the world. The 19th Congress is also bringing opportunities to Britain. The Chinese dream of national rejuvenation echoes with the British dream proposed by Prime Minister May. Socialism with Chinese characteristics for the new era is a match for the China-UK "Golden Era". The practical cooperation between China and Britain has become a fine example of win-win cooperation and common development between China and the West. Last year, China-UK trade totalled at 74.4 billion US dollars. From January to August this year, British export to China increased by 13.2%. China's direct investment in the UK exceeded 18 billion dollars, outnumbering Chinese investment in any other European country. In the coming years, our two countries can work harder to dovetail our respective development strategy and deepen cooperation on the Belt and Road Initiative. We can expand communication and cooperation in fields such as infrastructure, energy, finance, and high-tech. China and Britain have consensus on supporting economic globalization and free trade. 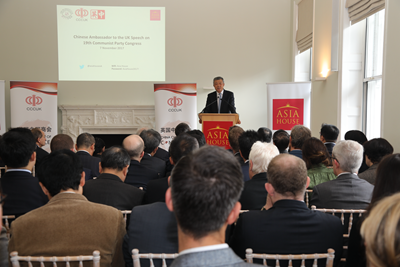 China is open to negotiating with the UK an arrangement for closer trade and investment ties. It is my earnest hope that on our way to realize the Chinese dream and the British dream, we can learn from each other so that our strengths will match up and our cooperation will go deeper. I believe, with concerted efforts, we can deliver more "golden fruits" in the China-UK "Golden Era". In the new era, we need a new outlook and we must achieve new success. Here, I wish to share with you my three hopes. First, I hope the British business community will learn more and learn in greater depth about the progress and changes taking place in China in the new era. General Secretary Xi quoted a poem to outline our motto: "Not angling for compliments, I would be content that my integrity fills the universe." I encourage you to visit and see more of China with your own eyes. In English, you say "Seeing is believing". In China, we have a much stronger expression. We say "Hearing a hundred times is not as good as seeing once." I hope from what you hear and see you will get an objective picture and all-dimensional understanding of China. I also welcome constructive suggestions and advice from you for China's future development. Second, I hope you will seize the opportunity of China-UK win-win cooperation in the new era. China's development is a great opportunity that mustn't be missed. I suggest you read the strategies and policies adopted at the 19th Party Congress carefully. This will help you seize the opportunities and catch the "express train" of China's development. This will help you tap into the cooperation potential and expand cooperation on the Belt and Road and other areas. 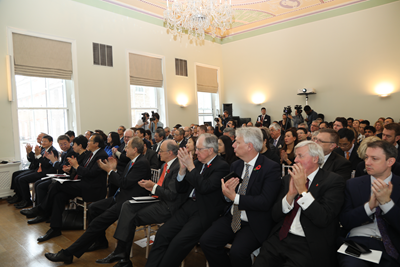 They will facilitate the common development and win-win cooperation between China and Britain. Third, I hope you will be more actively engaged in building the China-UK "Golden Era". The new five-year period marked by the 19th Congress will soon begin. The building of China-UK "Golden Era" will also accelerate. Sound China-UK relationship requires the unremitting efforts of both China and Britain. China in the new era will continue to power the building of the "Golden Era". I hope you will all get involved and contribute to the "Golden Era". 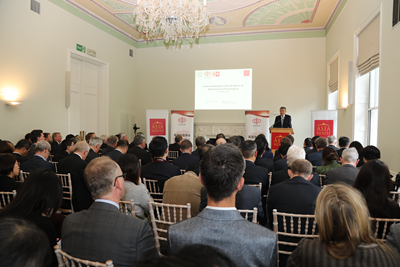 I also hope you will support stronger China-UK cultural ties and closer people-to-people exchanges. This is the "golden bond" that binds our nations together. This will also provide solid public support for our bilateral ties to grow to a new high. According to the Chinese lunar calendar, today marks the beginning of the winter. This reminds me of Percy Shelley's famous line. "If Winter comes, can Spring be far behind?" It is my firm belief that the Communist Party of China will lead the Chinese people to a decisive victory in building a moderately prosperous society in all respects. It will lead the Chinese people in the drive to secure the success of socialism with Chinese characteristics for a new era. It will lead the Chinese people in the pursuit of the Chinese dream of national rejuvenation. I also believe that China and Britain will each realize our respective dreams. We will become closer partners in building a community of shared future for mankind. We will work together for an open, inclusive, clean and beautiful world that enjoys lasting peace, universal security and shared prosperity. Together, we can and will build a better and brighter future for the world. Now I am ready to take questions.